Another new team member joins us this month. Heather Elder joins Sleeping Giant Media from SAGA. Heather has gained a huge amount of past experience working for Holiday Extras and SAGA and we are excited to have her join as the eighth member of the team. Heather has worked within the online marketing environment, and has a great understanding of PPC, SEO and Social media as well as developing her offline marketing experience at SAGA. Heather will be working as an account executive within Sleeping Giant Media bringing her knowledge and experience to our clients accounts. 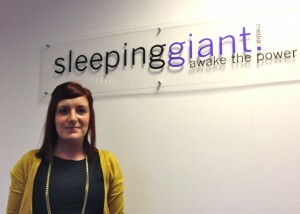 Heather joins Sleeping Giant Media only a month after Mersudin Forbes joined the team to help bolster the social marketing activities within the business. Heathers first day is on the 31st of October.